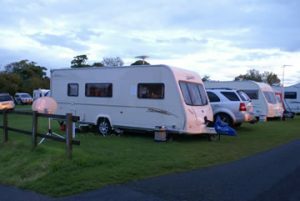 We were late booking our 2012 Whit Week caravanning break, but managed to secure a pitch at Scarborough Camping and Caravanning Club site from the evening of the Bank Holiday Monday – 4 June. We took the A570 near our home to join the M62 at Junction 7, turning east. Bypassing Manchester we continued north east on the M62 towards Leeds. The motorway was reasonably quiet and we were able to keep up a good speed. I enjoy driving on the M62 north of Manchester as it gives splendid views over the local hills and lakes. View of touring caravan on its pitch at Scarborough caravan siteWe turned off the M62 at Junction 28 and took the M1 northwards to bypass Leeds on the eastern side. At Junction 48, the interchange with the A1(M), we turned northwards. At Junction 44 of the A1(M) we turned east onto the A64 towards York. We stopped briefly at York West Services but could not find a suitable parking place with the caravan. We continued on and bypassed York on the A64 on its southern and eastern sides. Although it is a dual carriageway, the traffic on the A64 around York was very slow moving. However, when we eventually reached the A1237 roundabout, the A64 ahead of us cleared. From that point we made good progress all the way to Scarborough on the A64. On reaching Scarborough we drove through the centre of the town and out northwards on the A165 Burniston Road towards the suburb of Scalby. The Scarborough Camping and Caravanning Site is situated alongside the A165 on the northern outskirts of Scarborough. The Site entrance is located on Field Road (a minor left turning) but the site is clearly marked with a CCC sign on the A165, just before the turn – the site entrance is a few hundred yards along Field Road. It has a wide entrance, and there is a large car park immediately after the entrance with several car and caravan parking spaces marked out for arriving outfits. In addition there is an area for late night car parking. The main pitching areas are accessed through a keypad-controlled barrier adjacent to reception. We were given a barrier code when we booked in, and a friendly welcome by the wardens. The site was still busy from the Bank Holiday weekend, but we were led to our pitch by one of the wardens on a bike. Our pitch, although described as hardstanding, was actually grass with an embedded plastic mesh. The pitch was in an elevated position and it was possible to see the sea in the distance across the perimeter hedge, road and intervening fields. We were a little concerned that the pitch was next to a toilet block, but that did not prove to be a problem. Our elevated pitch gave views over the rest of the campsite, the sea to the west, and the surrounding countryside in other directions. Scarborough Camping and Caravanning Site is a large site with a mixture of approximately 300 grass and plastic-mesh “hardstanding” pitches spread over several “fields”. Non-members of the CCC are welcome by paying an additional fee. There are a number of toilet blocks and the one next to our pitch was modern, well-appointed and clean. Large wheeled bins are located next to the toilet blocks. Rather unhelpfully there are no re-cycling facilities on site, but campers are referred to a re-cycling facility about a mile along the main road. I find it hard to see how 300 individual campers driving their recyclable rubbish on a 2 mile round trip is very eco-friendly. In addition, we were given no opening times for the re-cycling facility, and when we tried to use it near the end of our stay it was closed! The site also has a children’s playground and a games room. An unusual feature of the campsite is an onsite restaurant which serves cooked breakfasts, fish and chips and other takeaway meals most evenings. Pets are welcome on the site and there is a dog walk. As our first evening was the eve of the Jubilee Bank Holiday we had a choice of events which we could attend. Scarborough’s open air theatre, which is the largest open air theatre in Europe, was showing the Jubilee Concert live on its big screen. Alternatively Scarborough Council was putting on a light and laser show and lighting a Jubilee Beacon at Scarborough Castle. The information leaflet I had found in the campsite’s Information Room said the show would be best seen from the South Shore promenade. After deliberation we decided to go for the light and laser show. After watching the first part of the Jubilee Concert on the TV in our caravan we set off by car for the South Beach at around 21.30hrs. We had to follow a rather tortuous route to the South Beach as the main promenade had road works and was only passable in a northerly direction. We drove over the dramatic Valley Bridge which links the north and south sides of Scarborough before driving down to the southern end of the South Beach. We drove along Foreshore Road which follows the line of South Beach and found a parking space at the northern end of the South Beach. We then walked back down to Sandside in front of the Harbour and joined a crowd of others waiting expectantly for the show to begin. 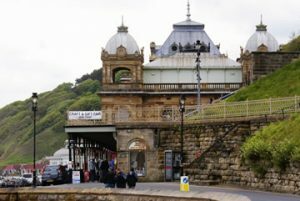 The South Beach is the more commercialised of Scarborough’s two main beaches and the seafront promenade is lined with brightly illuminated amusement arcades; there is also a small fun fair. Unfortunately we had made the wrong choice. Neither the light and laser show, nor the beacon, were visible from the South Beach promenade, and after waiting in vain for nearly an hour beyond the scheduled start time, the crowd of would-be spectators dispersed. After some compensatory fish and chips we returned to our car and drove back to the campsite. The local newspaper subsequently printed an apology from the Scarborough Council with a rather lame excuse that they had expected the show to be visible from South Beach, but had not been able to test this out previously as the show was meant to be a surprise. It certainly was a surprise, but not in the way that the Council had intended. The following day – Tuesday 6 June – dawned bright and sunny, although quite breezy, and we spent the morning lazing around recovering from the previous day’s drive and late night excursion. During the morning we spent some time considering our plans for the week. By late morning we had decided to return to the South Bay with a picnic lunch and sample its delights by day. As amusement arcades are not our “thing”, on reaching the South Beach we turned south and drove along the seafront road. The vehicle road ends at the Spa Complex and we found a roadside parking spot near to the Spa. This striking domed Victorian building includes a theatre, conference hall, several exhibition rooms, sun lounge, cafe and a parade of shops. There was a craft fair in progress in one of the exhibition rooms and we spent a pleasant hour browsing around the stalls. After looking around the Spa Complex we continued to walk south on the pedestrianised seafront promenade with its rows of beach chalets. During this walk I was able to take some good photos of the sea trips offered by “pirate ship” and speedboat. Upon reaching the end of the promenade we found a comfortable bench and enjoyed our picnic lunch while “taking in” the sea air close to the Clock Tower café. Suitably invigorated by our lunch, we returned to the Spa Complex and caught the South Cliff Lift which links the Spa Complex with the South Cliff above. 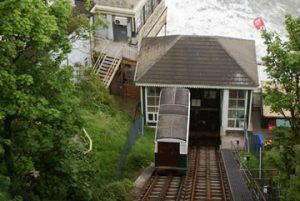 This funicular railway is the oldest in the UK and one of two of Scarborough’s original five cliff lifts still operating. The Cliff Lift speedily transported us to the lofty heights of the North Cliff Esplanade. We spent a very pleasant afternoon walking in the South Cliff Gardens. These Victorian Gardens, which stretch from the beach to the top of the South Cliff, are slowly being restored to their former glory by a local “Friends of South Cliff Gardens” and the local council with the aid of lottery funding. Particularly attractive are the Italian gardens with a pool, summer house and statues. At the southern end of the gardens there are the Holbeck Gardens with a bowling green and commemorative clock tower. The views along the coastline in both directions are stupendous. The view northward encompassing the headland crowned with the ruins of Scarborough’s medieval castle is particularly striking. Near the Holbeck Gardens there is a viewpoint and information board explaining the Star Disk on the shore far below. Built on the site of the former open air bathing pool, the Star Disk is the UK’s largest star map, and night lights show the position of the stars in the sky. After our pleasant afternoon in the South Cliff Gardens we took the Cliff Lift back to the Spar Complex. The high tide and onshore wind combined to give us spectacular waves which were breaking over the sea wall and onto the promenade itself, giving me a spectacular photo opportunity. A number of children were also enjoying dodging the waves. We returned to the car and drove back to the campsite, travelling along the whole of the seafront of the South and North Bays on Marine Drive and Royal Albert Drive. Wednesday 6 June was a rather wet day and so we stayed in the caravan. Cary did some paperwork and I watched TV and read. The weather cleared around teatime and provided us with a beautiful sunset. On Thursday 7 June the weather was brighter and so we went out in the car. We drove down to the beach at Scalby Mills at the northern end of North Bay and relatively close to the campsite. On the road down to the beach there is the “Old Scalby Mills” pub in a former water mill on the banks of Scalby Beck. Next to the beach there is the “Sea Life Centre” and “Pirate Adventure Mini Golf”. The car park was full so we continued into Scarborough. We drove along the top of the North Cliffs above North Bay, and after passing the ruined castle drove down the narrow streets and came out at the northern end of South Bay, taking Marine Drive around the base of Castle Hill and along the edge of the North Sands. There were a few hardy families on North Sand surrounded by windbreaks, but it was a bit too windy for us and we ate our lunch in the car overlooking the beach! After lunch we moved the car to the car park adjacent to Peasholm Park and went into the Northstead Manor Gardens. The Gardens are home to the recently restored Open Air Theatre which is the largest in Europe. The theatre puts on a range of shows throughout the summer season. The gardens are home to the main terminus of the North Bay Railway. 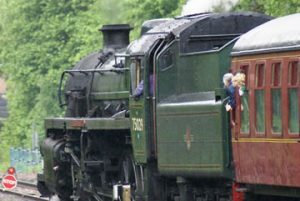 This miniature railway has four “steam” locomotives; although they are actually powered by diesel engines and pull a fleet of 10 open-sided carriages. The station also has a souvenir shop and café. Near the station is the historic splash boat which runs down a ramp into a section of the boating pool. There is also a café and seafood bar. The railway runs along the edge of the North Bay to Scalby Mills and we took a trip on the train. On the way it passes the rather sad ruins of the North Bay Cable Cars and former Marvel’s Amusement Park. At Scalby Mills the locomotives are turned on a turntable for the return journey. After watching the turntable in operation we walked down to look at the nearby “Pirate Adventure Crazy Golf”. The crazy golf site is very impressive with a range of novelty features. We did think of visiting the Sea Life Centre but were put off by the very lengthy queue. We then caught the train back to Northstead Gardens. After our return train journey we crossed the road to Peasholm Park. This pleasant park has an oriental theme and has been recently restored to its former glory. It has a large lake with a centre island surmounted by a Chinese Pagoda. There are a variety of boats available for hire on the lake, including dragon-headed pedalos. We walked around the lake and spent some time relaxing on a bench. The lake is still the venue for battles between miniature battleships which take place several times a week during the summer season. We did think of returning to watch this battle on the Saturday of our stay but decided to visit the North York Moors Railway instead. In the evening we returned to the caravan and changed into our “evening wear”. We had booked tickets for the evening Gala Concert at the Spa Complex by the Spa Orchestra. (The Spa Orchestra was celebrating its centenary year). The audience was quite small so we were able to obtain seats at the front of the circle, and we spent a very pleasant evening listening to a mixed programme of popular classical music and more modern pieces. On Friday 8 June we spent the morning shopping in the centre of Scarborough. The town has a good range of chain and independent shops and we were able to purchase all that we needed. After we had finished our shopping trip to the centre of Scarborough we decided to spend the late afternoon visiting Filey. We took the A165 south and parked on the seafront at Filey. We spent a pleasant afternoon walking along the seafront enjoying the sea air and views north to Filey Brigg and along the sea cliffs southwards. At the northern end of Filey Bay there is the slipway with the traditional Coble boats. These high-bowed boats are sturdily made so that they can be pulled over the beach by tractor. It seems that the tractor tyres are partly filled with water so that the tractor has a better grip when launching the boats into the sea. The redeveloped seafront promenade is very pleasant with modern public toilets, a café and several shops. 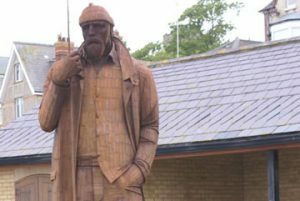 There is also a spectacular 12 foot high sculpture of a fisherman titled “A High Tide in Short Wellies”, by Ray Lonsdale, which has rusted to a lovely colour. On the way home we stopped for our evening meal at the Scalby Manor Crown Carvery. This restaurant is on the main A711 next to the campsite. The restaurant is very popular with campers on the site, and in fact there is a gateway between the caravan site and the restaurant car park. The restaurant serves cooked breakfasts in the morning, and for the rest of the day offers carvery meals at £3.99 per person. The restaurant is rather run-down, but the three different types of roast meat and wide range of vegetables were very tasty and we enjoyed our meal. On Saturday we decided to take a trip on the North York Moors railway which was advertising a “60’s” weekend. We drove to Whitby, taking minor roads through Ravenscar and Robin Hood’s Bay enjoying the lovely coastal views enroute. At Whitby we parked in one of the main car parks near to the station and bought Day Rover tickets for the journey from Whitby to Goathland. The Day Rover tickets were quite expensive at £13.50 each, but it meant that we could break our journey wherever we wished. The steam-hauled train was quite busy, but we were able to find seats in a compartment. I, however, spent most of the journey reliving my youth, hanging out of one of the carriage windows taking photos. As the son of a former British Railways porter, many of my childhood journeys were spent travelling by train and I just love these nostalgic trips. We stayed on the train until we reached Goathland Station where we disembarked. The village of Goathland is located in the North York Moors National Park and is the fictional Aidensfield in the TV series “Heartbeat”. This popular series is based around the work of the local police force and has a musical backing of a range of “60’s” pop songs; the programme is a favourite of ours. Goathland station was also “Hogsmeade Station” in the film “Harry Potter and the Philosopher’s Stone”. 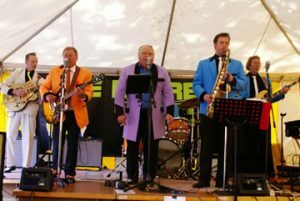 As part of the NYMR’s “60’s” weekend, there was a marquee set up in the Station Car Park with a bar and a number of rock and roll groups performing. We spent a very pleasant hour watching some 50+ “teddy boys” performing a variety of “60’s” hit songs. There were also a number of cars and other vehicles from the same era around the station, and more in the village itself. We took the short walk up the hill from the station to the village which is very picturesque and has a number of buildings made famous in “Heartbeat”. The village Post Office and other shops are overflowing with “Heartbeat” memorabilia. The former village garage is now a souvenir emporium and surrounded by a range of “60’s” cars. The “Goathland Hotel” also capitalises upon its “Heartbeat” role as the “Aidensfield Arms”. There were more classic cars on show on the Goathland village green, including two Ford Anglia saloons in the light blue livery of the police car in “Heartbeat”. These cars were of particular interest to me, as the first car which I bought in 1972 for £75, was a 1964 Anglia in the exact same shade of light blue. After spending a pleasant time at Grosmont, we caught the last train of the day back to Whitby. At Whitby we walked around the harbour, and having bought some of Whitby’s famous fish and chips, dined out on a bench with views of the harbour and the Abbey on the Headland beyond. 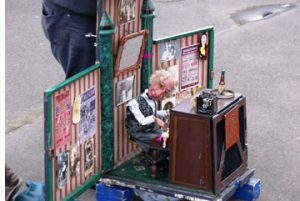 We were entertained during our stroll by a street puppeteer whose puppet “played” a piano. We then drove back to the campsite for the final night of our stay. On the morning of Sunday 11 June we packed the caravan and hitched up for the journey home. Leaving mid-morning we followed the reverse of our outward journey home. The delays near York on our outward journey were not repeated and we made good time. The weather was good and we had a smooth and uneventful drive back to St Helens. We arrived home late afternoon and after parking the caravan on our drive we were able to unload the caravan quickly and smoothly. We enjoyed our return to the Scarborough area and our first stay at the Scarborough Caravanning and Camping Club Site. Header banner image credit to Thomas Tolkien from Scarborough, UK [CC BY 2.0 (https://creativecommons.org/licenses/by/2.0)], via Wikimedia Commons.